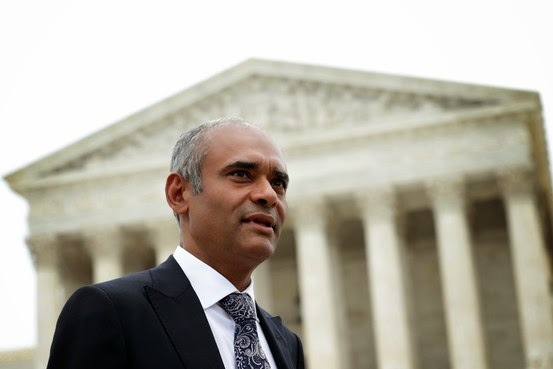 The U.S. Supreme Court on Wednesday handed a high-stakes victory to broadcasters, ruling online video startup Aereo Inc. violated copyrights on their programming. 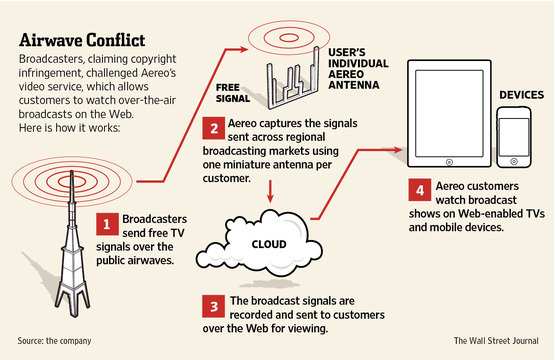 The ruling is a significant blow to Aereo, a service that has allowed subscribers to watch and record their local over-the-air broadcasts from an array of electronic devices. The company aimed to appeal to cord cutters who were seeking Internet-based alternatives to cable television. The broadcasters, including Walt Disney Co., ABC, Comcast Corp.'s, NBC, CBS Corp. and 21st Century Fox, argued Aereo exploited their programming without authorization, in violation of exclusive rights to the public performance of their works. Shares of CBS, Walt Disney and 21st Century Fox all moved higher on the verdict. Aereo CEO Chet Kanojia leaving the U.S. Supreme Court after oral arguments April 22 in the television broadcasters' copyright case against Aereo. Justice Stephen Breyer wrote the majority opinion siding with broadcasting companies. Wednesday's ruling rejected Aereo's arguments that its service avoided copyright violations because it did little more than give consumers an Internet-based way to watch programs that they were already entitled to watch over the air for free. Aereo's service operates with thousands of dime-sized antennas stored in warehouses that capture local broadcast signals. Each subscriber who logs on to watch or record a program is assigned a different antenna, meaning that no two customers are watching the same copy of a program. The company argued the service's design avoided issues related to broadcasters' exclusive rights to the public performance of their works. The court held that Aereo improperly used broadcasters' copyrighted works, no matter the technical make-up of its system. "We conclude that Aereo is not just an equipment supplier," Justice Breyer wrote in the opinion. "We do not see how the fact that Aereo transmits via personal copies of programs could make a difference." Joining the opinion were Chief Justice John Roberts and Justices Anthony Kennedy, Ruth Bader Ginsburg, Sonia Sotomayor and Elena Kagan. Three conservative justices dissented, saying the majority's ruling "will sow confusion for years to come." That dissent, written by Justice Antonin Scalia, said the court distorted federal copyright law to rule against Aereo. If the service is a problem, it was up to Congress to address it, Justice Scalia said. Broadcasters had worried that a court decision upholding Aereo could have undercut billions of dollars in revenue the networks receive from cable and satellite companies, which pay to retransmit the networks' programming. Other concerned parties included professional sports leagues, which said their lucrative licensing deals with broadcast networks would be undermined if third parties could retransmit games without permission. Computer and software makers were also watching the case closely for its potential impact on the cloud-computing industry, given that Aereo is a cloud-based service. The court took pains in its opinion to say that the ruling against Aereo was limited and wouldn't discourage the use or development of other emerging technologies. "Today's decision is a victory for consumers. The court has sent a clear message that it will uphold the letter and spirit of the law just as Congress intended," said Paul Clement, an attorney for the broadcasters. ABC's parent Disney said, "We're gratified the court upheld important copyright principles that help ensure that the high-quality creative content consumers expect and demand is protected and incentivized." In a written statement, Fox's parent 21st Century Fox said it "welcomes" the decision. Aereo CEO and founder Chet Kanojia said the ruling was a "massive setback" for consumers that "sends a chilling message to the technology industry." "Free-to-air broadcast television should not be available only to those who can afford to pay for the cable or satellite bundle," Mr. Kanojia said.